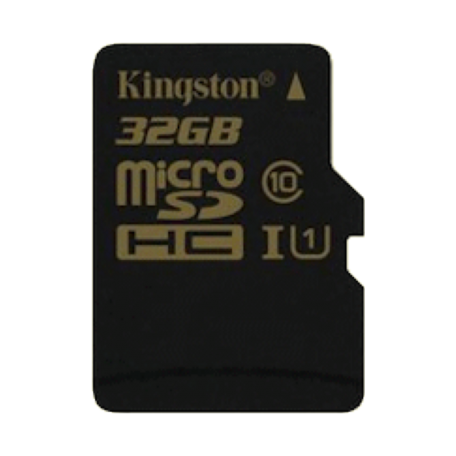 Kingston SDCA10/32GB MicroSDHC kaart kopen? | That's IT! Kingston’s SDCA10 Class 10 UHS-I (Ultra High-Speed Bus, Speed Class 1) microSDHC card delivers 90MB/s read and 45MB/s write speeds; it reads up to 9x faster and writes up to 4.5x faster than standard Class 10 microSDHC/SDXC cards. UHS-I U1 technology lets users shoot full HD video, 3D video and real-time broadcasts without interruption and capture images continuously on their phones. Higher sustained write speeds ensure video integrity by reducing stutter and faster transfers free up user’s time, especially when using Kingston USB 3.0 card readers. In 16GB and 32GB capacities, SDCA10 Class 10 UHS-I lets users record more video without changing cards. Up to 80 minutes of 48 Mbps video, up to 28 compressed MP4 videos or up to 8,302 MP3 files can be stored on a 32GB card, so it’s easy to take movie collections and music libraries wherever you go. This versatile card is waterproof, shock and vibration proof, x-ray proof and temperature proof.4 Photographers can feel secure using the card for action photography and in harsh or unstable conditions. Smartphone, tablet and small-format camera users will benefit from the enhanced transfer speeds and performance gains offered by the SDCA10 Class 10 UHS-I card, which is compatible with microSDHC host devices and not compatible with standard microSD-enabled devices and readers. Maximise your card’s performance by pairing it with a UHS-I supported reader such as Kingston’s MobileLite G3 or USB 3.0 Media Reader. It’s backed by a lifetime warranty, free technical support and legendary Kingston® reliability.